BEIJING - Dongfeng Motor Corp, the second-largest automaker in China by sales, recently announced it will invest 30 billion yuan ($4.7 billion) in its own-brand vehicles over the next fiveyears. Aspiring to become the top domestic automaker and a first-class international producer, its goal is to sell 3 million of its own-brand vehicles in 2016, up from about 1 million this year. The automaker based in Central China's Hubei province said a third of the 3 million units will be commercial vehicles. It plans to develop 14 new platforms in the sector in the next five years. Another third will be passenger vehicles carrying the nameplates of Dongfeng's wholly owned brands Fengshen and Xiaokang, according to the recently announced plan. 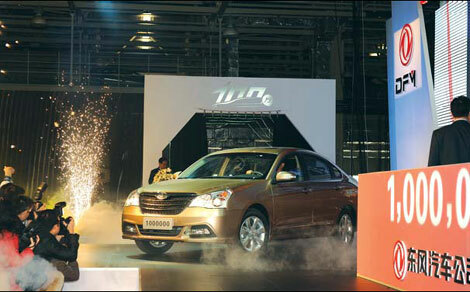 The company said it will introduce 18 new models - cars, SUVs and MPVs - as well as three minivan series before 2016. Its Fengshen A60 sedan rolled off the production line earlier this month and will go on sale next year. It is the fourth model under the Fengshen brand following the S30, H30 and H30 Cross. The remaining 1 million vehicles will include cars made at its joint venture with Taiwan's Yulon Motor Co and new local brands developed at its partnerships with Nissan and Honda. Dongfeng plans to introduce 20 new passenger cars and one family of microbuses as jointventure-built models in the next five years. Zhu Fushou, managing director of Dongfeng, said the company will fight "on two fronts" - with joint ventures and its own-brand businesses. The company said it aims to increase the ratio of R&D investment to 3 percent of revenues, upfrom the current 2.36 percent. Along with boosting sales, industry observers said the ambitious plan is designed to respond to criticism that State-owned automakers have long been slow to develop homegrown brands, instead relying on foreign partners to generate sales and improve technology. Dongfeng has joint ventures with Japanese carmakers Nissan and Honda, South Korea's Kiaand France's PSA Peugeot Citroen. Other large State-owned carmakers - SAIC Motor Corp, FAW Group, Chang'an Automobile Group, Beijing Automobile Group and Guangzhou Automobile Group - all have lucrative Sino-foreign joint ventures, but generally lack competitiveness with their wholly owned brands. Dongfeng sold some 2.8 million vehicles in the first 11 months of this year - an increase of 12 percent from a year ago - and is expected to break the 3-million-unit benchmark in full-year sales. But only 300,000 - or 10 percent - are its own-brand cars. The market share for domestic-brand cars was down 1.5 percentage points to 29 percent inthe first 11 months, according to China Association of Automobile Manufacturers. As well, most domestic brands compete in the medium and low-end segments, which have thin profit margins. Zeng Zhiling, director of JD Power-LMC Asia Pacific Forecasting, said that the decline in share for domestic brands was mainly due to the expiration of government subsidies on small engine vehicles that over-stimulated customer demand over the previous two years. He predicts their share will bounce back to more than 30 percent next year on favorable government procurement policies and a resurgent overall market. Domestic carmakers are also working hard to improve competitiveness. SAIC Motor Corp, the largest automaker in the country, announced earlier this year that it will invest 22 billion yuan in its wholly owned brands Roewe and MG between 2011 and 2015. Beijing Automobile Group rolled out its first own brand car at the end of 2010 and plans to introduce more than 20 new models over the next five years, including cars based on the Saab technologies it acquired. The company's goal is to reach annual sales of 700,000 own brand vehicles in 2015. 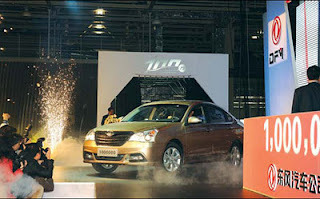 Guangzhou Automobile Group unveiled its first own-brand car last year carrying the badge Trumpchi. An SUV from the new brand made its debut at the Guangzhou auto show in November. But domestic brands will be battling in the world's fiercest market. China now has the most carbrands on sale than any other country and already successful, global brands are racing to greatly expand production. Local products will struggle for the foreseeable future in such a crowded, hyper-competitive market, said Bill Russo, senior advisor at consultancy Booz & Co.
As well, a significant number of used cars will add additional competition, as many consumers prefer a foreign-brand used car as a reasonably priced alternative to a new Chinese model, he said.